As a vSphere engineer, we’re usually limited to vMotion domains that are limited by a vCenter Server construct (or more specifically, the data center in many cases due to network configurations). 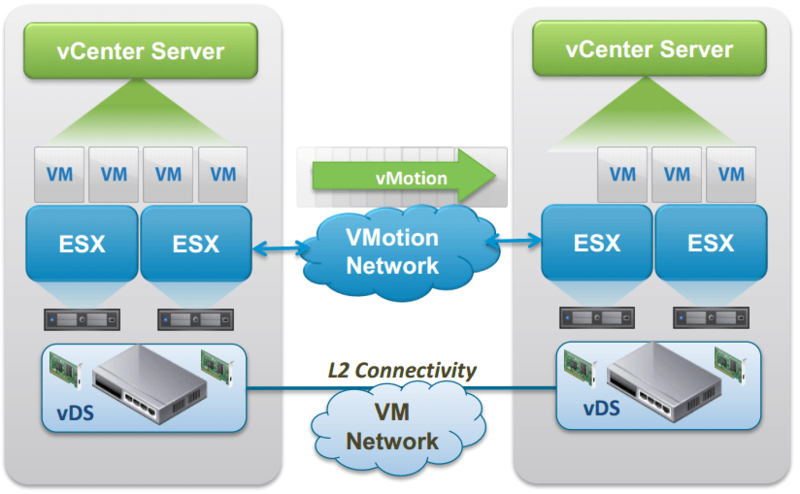 vSphere 6 will allow VMs to vMotion across Datacenter and VC boundaries using a new workflow. You’ll also be able to take advantage of a workflow that lets you hop from one network (source) to another network (destination), eliminating the need to have a single vSwitch construct spanning the two locations. And while you can request a RFQ (request for qualification) to use Layer 3 for vMotion, most of us are limited (or comfortable) with Layer 2 vMotion domains. Essentially, this means one large subnet and VLAN stretched between compute nodes for migrating workloads. An upcoming feature will allow VMs to vMotion using routed vMotion networks without need for special qualification. In addition, another useful feature planned will revolve around the ability to vMotion or clone powered off VMs over NFC networks. And finally, the latency requirements for vMotion are being increased by 10x. Enterprise Plus customers today can tolerate vMotion RTTs (round trip times) of 10 ms or less. In the new release, vMotion can withstand 100 ms of RTT. If you want to work with these technologies in greater depth, sign up for the public beta of vSphere 6 here. You can also read Julian Wood’s excellent take on vMotion enhancements here. Thanks Chris! Just signed up for the Beta program!